In this SAP Press book chapter excerpt, learn SAP Financial Accounting basics such as maintaining General Ledger, running Account Detective reports, and viewing standard aging reports. experience. Learn Financial Accounting basics, such as maintaining General Ledger, running Account Detective reports, and improving the format of standard aging reports. You can maintain multiple general ledger accounts by using the hierarchical display setting. Creating and maintaining a general ledger account is usually done by first accessing Transaction FS00. This method is fine if you are creating or maintaining a single account and you have all of the relevant data you need to find the account, such as the account number range, company code data, and descriptions. However, if you want to have quick access to multiple accounts during maintenance in order to easily scan through similar accounts that you want to copy from, then your best option is to use the Hierarchy display functionality. 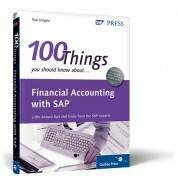 This excerpt from 100 Things You Should Know About Financial Accounting with SAP by Paul Ovigele is reprinted here with permission from SAP Press, copyright 2011. Download a PDF of this chapter. You can access the Hierarchy Display setting by going to Transaction FS00 (General Ledger Account Master Data) and selecting the menu option Settings • Hierarchy Display. You will see a dialog box asking whether you want to display the accounts in a navigation tree or not. Choose to display the accounts in a navigation tree, and restart the transaction. You can exit the current transaction, restart it, or type “Transaction /nFS00” in the command field to access the screen, as shown in Figure 1. The folders that are displayed in the left part of the screen represent the account groups that the general ledger accounts belong to. You use the account groups to control the number range intervals of the accounts per chart of account. The account groups also control the field statuses (suppressed, optional, required, or displayed) of the fields that are available in the account master record . You can click on the triangle icons beside the account group folders to view the general ledger accounts that exist in those groups. The right part of the screen is the traditional Master Data Maintenance screen for a general ledger account. By double-clicking on an account on the left part of the screen, you can maintain or display the details of the account on the right part of the screen. You can use the icons shown at the top of the screen to quickly access the functionality for maintaining the accounts. If you want to create a new account in a particular number range, you can easily check the hierarchy to see what the next available number is. You can then select the account that you want to copy from, click on the copy icon, and enter the account number you want to create. By using the Find icon, you can search for an account’s number or description in a company code. This is useful when you are creating an account that may already exist as a different number. By putting all or part of the description in the search field, you will find out if there is a similar account in the same or a different account range. The Block and Mark for Deletion icons are available here, as they are with the normal maintenance view. However, it is easier to scan through several accounts with the hierarchical view and check or maintain the block and deletion settings. Last, you can easily change the view from one company code to another by clicking on the Change Company Code icon. You can use the Account Detective to find where accounts have been automatically assigned. There has never been an easy way to find out where an account has been assigned without going into several configuration transactions. However, SAP recently delivered the Account Detective Report (available with SAP ERP 6.0), which changed all that. This new report lists all of the accounts in a company code or chart of accounts, along with their master data settings, and gives you the option of finding out where they have been assigned. Let’s explore this report and learn how to access it. takes you to the screen shown in Figure 1. If you want to analyze the accounts in just one company code, then enter the company code and check the Only Accounts in the Company Code box. Then enter the relevant controlling area and chart of accounts. You can only enter one chart of accounts because most account determination tables are populated on a chart of accounts basis. Figure 2 shows how the report is displayed when you click on the Execute button. If you do not select any of the options in the Account Determination Analysis section, you will see a list of the accounts that you selected and their respective settings in the general ledger master record. This list is useful if all you want to do is analyze, for example, the number of accounts that are open item managed, available for line item display, or automatically posted to. If you select any of the Account Determination Analysis checkboxes, you will see the list of master data settings as the header line and the tables (such as T095 and CSKB) where the accounts have been assigned in the item lines. You can see in Figure 2 that account 00010000 is assigned to tables T095 and T095B (these are the tables for asset account determination) and to table CSKB (this is the Cost Elements table), where it is assigned to a cost element category of 90. You can display the standard aging reports in a much more user-friendly format by changing your system settings. SAP ERP has always come with predelivered customer and vendor aging reports (the reports that classify the open items of vendors and customers according to the number of days they are overdue in different intervals such as 1-30, 31-60, 61-90, etc.). There is, however, a lot of confusion about which reports should be used for aging purposes (none of the reports has the word aging in them) and how to improve the format of these reports for better usability. In this little-known tip, we will focus on how to improve the aging reports for customers. Enter the intervals you want to display in the Due Date Sorted List section of the report, as shown in Figure 1. When you execute this report, you will see the relevant information of your customers’ items in the intervals (for example 30, 60, 90, 120) that you specify in the Due Sorted List part of the selection screen. The problem with this report is that the format is not very user-friendly and cannot easily be downloaded. The system displays an address block for each customer, as shown in Figure 2. To make this report more user-friendly and convert it into an ABAP List Viewer (ALV) format, click on the Start button on your computer desktop. Go to the Control Panel, and double-click on the SAP Configuration icon. Now go to the Design Selection tab, select the Use Classic Design radio button, and select the Use Accessibility Mode checkbox, as shown in Figure 3. Now you can save the settings shown in the screenshot in your computer. Note that depending on the version of Windows or Macintosh that you are using, the options you can select may be slightly different. In this example, we are using Windows XP. You need to log off and then back on to the SAP system for the changes to take effect. When you do, you can go back to Transaction S_ALR_87012176 and execute the report to see the layout shown in Figure 4. This list shows a much better display than the one using the standard settings. You can perform the usual ALV functions (which you can’t do in the standard report) such as sort, filter subtotal, and download to Excel. You can double-click on each line to see the details that make up the amount, which is not possible with the standard report. For certain versions of Windows, you may find that the next time you log off and on to your computer, your SAP screen has the older “classic” format. If this is the case, deselect the settings that you made in this tip, and only reset them when you need to display the aging reports.